To get your free, 27-page PDF of The Leader's Guide, just enter your first name and primary email address in the fields to the right. And please add christopheravery [at] christopheravery [dot] com to your whitelist or address book. 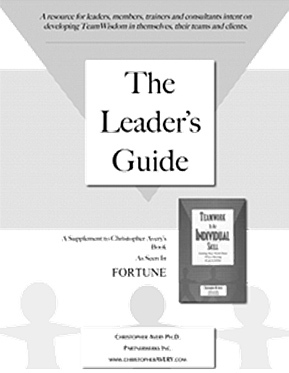 After confirming your email address, you will receive an email with The Leader's Guide PDF attached. Enjoy this free gift. The Leader's Guide is a free, 27-page resource for leaders, members, trainers and consultants who are intent on developing team leadership abilities in themselves, their teams, and their clients. This is the supplement Christopher mentions in his book Teamwork Is An Individual Skill: Getting Your Work Done When Sharing Responsibility. It enhances the book's message and will save you time because it is designed to direct you to the sections that are most valuable for your particular situation. It also helps to review Teamwork Is An Individual Skill. "The value I intend to offer you through this guide is clarity of organization and focus. The Guide can quickly direct you to the most useful sections and exercises in Teamwork Is an Individual Skill based on your team development needs and situation. That can save you time and help you develop clarity about what to do to build your team. This guide can also help you review the material in Teamwork Is an Individual Skill from different points of view since the guide is organized around the team development roles of manager, leader, member, trainer, and consultant."